Great support for the Game Master and truly appreciate for the coordination for our company mini team building . Food arrangement & quality are excellent. Keep it up!! Great games and friendly staffs ! Recommended to all who are keen to have team building event ! Went to Queensbay Mall Mission Q and played the Quantum room. It was really interesting and different from usual escape rooms. 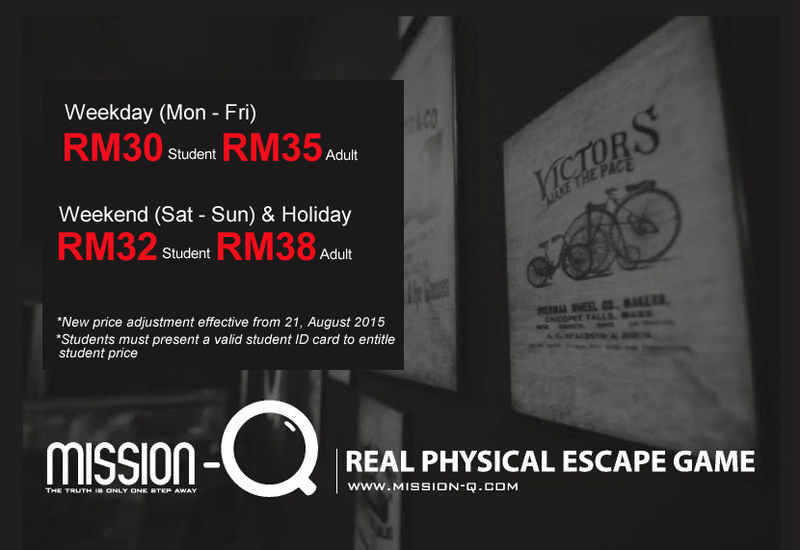 We enjoyed every bits of it and will definitely recommend it to other escape room fans. The staffs are really friendly and helpful too. Yeah it was fun and challenging. I enjoy the puzzles. Remarks: Can history be rewritten? Description: 30 years have passed an incident not avoided, A death, a loss of a loved one, history all recorded, but now the secrets of space and time are in your hands, with hopes of changing history; to be granted one last demand, given the chance, will fate and luck hear your plead. Will you be trapped in the warps of time, or will you succeed? Remarks: The brightest flame casts the darkest shadow. Description: Almost a decade has passed since the infamous St. Andrews Psychiatric Clinic was abandoned, sitting empty and desolate at the end of a quiet road. Throughout the years, many have reported sightings of supernatural activity in the clinic; a lone figure dressed in white flitting through the halls, red eyes always watching from dark corners, and whispers echoing through the building in the dead of the night. As famed paranormal investigators, dare you investigate the truth behind these sightings? Remarks: The mystery of black and white. Description: The Penguins of Madagascar are being held captive after their futile attempt in escaping the zoo and their anonymous kidnapper is on the loose. Their foot tracks lead you to an abandoned place where the mischief in black and white slowly unfolds. But with an approaching snowstorm that devours anything in its way, is there sufficient time to rescue them? Description: Prophecies, a haunting burden to chosen ones. When a secret scroll was proffered to Soyfa by the illusionist, she must do whatever it takes to disclose the puzzling secrets of the scroll because she, is the chosen one. Will you shoulder this burden with Sofya and help her to fulfill the prophesies events that have yet to come? Make your choice before time runs out. Address: 3F-21 & 22, Queensbay Mall, 100 Persiaran Bayan Indah, 11900 Bayan Lepas, Penang.